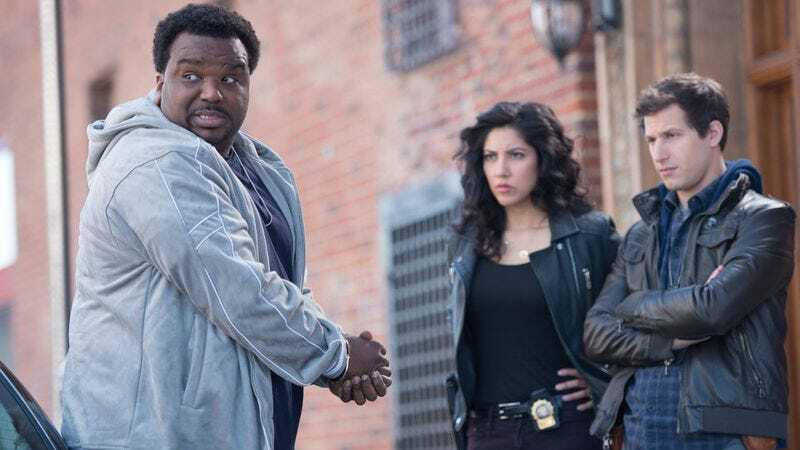 According to Entertainment Weekly, Craig Robinson will return to Brooklyn Nine-Nine this season as lovable car thief Doug Judy—better known as the Pontiac Bandit. Robinson will apparently show up for Nine-Nine’s Christmas episode, which will see him teaming up with Andy Samberg’s Jake Peralta in order to stop a drug kingpin. Dan Goor, one of the show’s executive producers, told EW that the two will have to “work intimately” together and that—spoiler alert—they’re going to “eat Lobster Thermidor while wearing bathrobes.” Though the show is playing the “hero and villain team up to defeat a common foe” card a little early, it does seem like Brooklyn Nine-Nine is trying to set Robinson’s character up as a Sideshow Bob-esque recurring villain who can pop in whenever the writer’s feel like using him. Robinson will be joining a bunch of other guest stars on Brooklyn Nine-Nine this season, including Kyra Sedgwick, Jenny Slate, and Eva Longoria. The show’s second season will premiere on Fox on September 28.